Americas gateway to the universe. Leading the world in preparing and launching missions to Earth and beyond.October 9, 1998 John F. Kennedy Space CenterVol. 37, No. 20 Spaceport News In 1984, Congress authorized NASA to build a major new space station as a base for further exploration of space. When the Clinton Administration took office in 1993, the facility became known as Space Station Alpha. Russia joined with the United States in the same year to collaborate in building a joint facility. When other international partners came on board, the station became formally known as the International Space Station (ISS). The assembly and operation of the ISS will usher in an era of unprecedented space research capability. In addition to nurturing industries key to the countrys economic growth, the International Space Station may well incubate humanitys evolution into the cosmos. By learning how space affects the human body and by developing countermeasures for undesirable and damaging effects of living in orbit, we could potentially prepare for the settlement of humans on Mars and beyond. Building and operating the International Space Station is only part of NASAs mission for the 21st century. An army of robotic sentries will also scour the universe for clues to our existence and collect information about the origin of the cosmos. Telescopes, probes and rovers will travel through time and space, even returning samples to Earth for analysis. Ultimately, the questions we ask and the responses we discern will shape our own future as a space-faring species. The eyes of the world will be focussed on Space Shuttle Discovery on Oct. 29 as one of its seven crew members makes history once again. When John Glenn Jr. went aloft on Feb. 20, 1962, he was the first American to orbit the Earth. When he lifts off as STS-95 Payload Specialist Glenn, he will become the worlds oldest astronaut at age 77.STS-95 preview: Glenn and nowGathered around a table in KSCs Orbiter Processing Facility Bay 2, the STS-95 crew share a light moment as they look over equipment during the Crew Equipment Interface Test in September. From left are Mission Specialist Pedro Duque with the European Space Agency; Payload Specialist Chiaki Mukai with the National Space Development Agency of Japan; Mission Specialist Scott Parazynski, M.D. ; Pilot Steven Lindsey; Payload Specialist John Glenn Jr.; Mission Specialist Stephen Robinson; and Mission Commander Curtis Brown Jr. Behind the crew is Adam Flagan, United Space Alliance. (See STS-95, Page 4)Journey through Atlantis In fact, Glenn is not only flying as payload specialist; he himself is a payload for the crew. It is not the first time a crew member has been studied for medical purposes in space, but it will be a first for geriatric research in space. And the tests that will be run on Glenn would try the patience of any patient. Throughout the flight, Glenns heart rate, respiration, blood volume, and blood pressure will be monitored regularly. Doctors on Earth want to analyze his blood for immune function and protein levels, and this will require taking so many samples that throughout the flight, Glenn will wear a catheter implanted in his arm, allowing easy access to a vein without a new needle stick each time. He will wear a suit wired with sensors to measure his sleep cycles and will swallow a horse-pill-size thermometer that will take temperature readings as it passes through his body. These and other findings will be compared with base-line readings taken before lift-off, which are already being assembled. Glenn routinely strolls the grounds of Johnson Space Center with monitors strapped to his wrist and belt. When he returns from space, he will face yet another battery of tests, including a Magnetic Resonance Imaging test to look for changes in his spinal cord and bone-density tests to look for The orbiter Atlantis recently returned from the Palmdale, Calif., facility, where it spent 10 months undergoing one of the most extensive orbiter modification and maintenance periods in the Shuttle programs history. This time, the orbiter Atlantis underwent 443 structural inspections and at least 150 major modifications, including several upgrades enabling it to support International Space Station (ISS) missions. As one of the more significant modifications, Altantis became the first orbiter to obtain a fully digital (See Atlantis, Page 5)The Shuttle Carrier Aircraft gently lands its piggyback cargo, the orbiter Atlantis, at KSCs Shuttle Landing Facility. Atlantis returned home on Sept. 27 after a 10-month stay in Palmdale, Calif., undergoing extensive modifications. The return flight included a fueling stop in Ft. Hood, Texas, and a four-night stay at Ft. Campbell, Ky. Atlantis is scheduled to fly in June 1999 on the third International Space Station mission. SPACEPORT NEWSOctober 9, 1998 Page 2 1998 Open House to celebrate NASAs past, present and future This years Open House guests will have a chance to pay tribute to NASAs past, view present-day Space Shuttle hardware and payloads and get a glimpse into the future of the space agency. KSCs Employee Open House is being held Oct. 10 from 9 a.m. to 2:30 p.m., celebrating NASAs 40th anniversary. Facilities will close at 3 p.m. Among the many early space-age launch vehicles that will be on display at the Air Force Space Museum at Cape Canaveral Air Station is a Thor rocket, the predecessor of todays Delta launch vehicles that lift off from nearby Launch Complex 17. On Oct. 11, 1958, a Thor-Able-1 rocket launched the Pioneer 1 spacecraft from Pad 17A on its way to explore the moon. This was the first NASA-directed launch after the space agencys first official day of operation on Oct. 1 of that year. Visitors will also be able to visit the Complex 14 blockhouse at CCAS and Complex 5/6 at the museum. Astronaut John Glenn lifted off from Complex 14 Feb. 20, 1962, while Alan Shepard rode a Mercury/Redstone rocket from Complex 5/6 on the countrys first suborbital flight on May 5, 1961. At the KSC Visitor Complex, a special tour of the Apollo/Saturn V Center will be offered. The highlight of present-day Shuttle operations for Open House visitors will be a drive-by tour of the Space Shuttle Discovery at Launch Pad 39B as it is readied for the STS-95 mission. Another key point of interest will be the new Space Shuttle Main Engine Processing Facility. This will be the first time ever that Open House guests will be able to tour this new home for the processing of the liquid-fueled orbiter main engines. Other facilities not to be missed are the Vehicle Assembly Building, where visitors may be able to see the solid rocket boosters and external tank stack for the STS88 mission; Orbiter Processing Bay 3 where the orbiter Columbia and Shuttle space flight hardware will be available for viewing; the Space Shuttle solid rocket booster retrieval ships at Hangar AF at CCAS; Shuttle transportation equipment near the VAB; and aircraft at the Shuttle Landing Facility. Many other facilities, including the Operations and Checkout Building, will feature an abundance of demonstrations and exhibits in laboratories and operations rooms. In the Space Station Processing Facility (SSPF), visitors will see elements of the International Space Station, including the first U.S. components, the Unity connecting module and Pressurized Mating Adapters, and the Italian Space Agencys Leonardo Multi-Purpose Logistics Module. Although the SSPF high bay will be closed to visitors, NASA and Delaware North Park Services have teamed to allow employees and their guests to see the ISS elements and support hardware from the high bay viewing window via the International Space Station Center in the Engineering Development Lab from 9 a.m. until noon only. Another view of the future at KSC can be seen at the Launch Control Center, where the Product Demonstration Area in the Firing Room 2 front bubble will showcase the next-generation Checkout and Launch Control System. The Advanced Systems Laboratory located in the high bay next to the Launch Equipment Test Facility in the KSC Industrial Area, will feature automation and robotics projects developed to improve Shuttle ground processing operations. The adjacent Intelligent Systems Lab will have demonstraHere is some information on 1998 KSC Employee Open House events, services and attractions in addition to those listed in the Open House map/brochure issued to all employees this week. Four NASA astronauts will participate in Open House activities and make visits to several facilities throughout the day, as follows: 9 to 10 a.m. O&C Mission Briefing Room SSPF Flight Crew Equipment Lab Orbiter Processing Facility 3 Vehicle Assembly Building 10 to 1 1 a.m. Complex 14 CCAS ISSC Tour Stop LCC Firing Room 2 SSMEPF 1 1 a.m. to noon Hangar AF O&C Mission Briefing Room ISSC Tour Stop Orbiter Processing Facility 3 1 to 2 p.m. VAB/Fire Station 2 LCC O&C Mission Briefing Room Orbiter Processing Facility 3 2 to 3 p.m. Orbiter Processing Facility 3 VAB SSPF Flight Crew Equipment Lab SSMEPF Cafeterias in the Headquarters Building, Space Station Processing Facility (SSPF) and the MultiFunction Facility (MFF) in the Launch Complex 39 Area will be open from 8 to 10 a.m. on Open House day to serve breakfast for Open House volunteers. The KSC KARS Flyers will be providing demonstrations with remotely controlled scale-model aircraft near the Operations Support Building at the Shuttle Landing Facility. The KSC Amateur Astronomers Club will have an exhibit in the Mission Briefing Room of the Operations and Checkout Building. The blockhouse at the launch site tions of Virtual Reality technology, wireless handheld computers and neural network systems for the automated inspection of flight and ground hardware. More information is also available through the 1998 KSC Open House home page at http://www.ksc.nasa.gov/events/ 1998/openhouse. where astronaut John Glenn lifted off on the first U.S. orbital mission, Complex 14 at Cape Canaveral Air Station (CCAS), will be open from 9 a.m. to 3 p.m. The structure is a restored historical site and features displays on launches from that pad. Glenn rode into orbit aboard his Friendship 7 Mercury capsule atop an Atlas rocket from Complex 14 on Feb. 20, 1962. Three other astronauts were lofted into space aboard Mercury/ Atlas launch vehicles from this site, including Scott Carpenter, Wally Schirra and Gordon Cooper. To get to Complex 14 from KSC, take NASA Causeway east to CCAS. Then take Central Control Road to ICBM Road and turn left, continuing northwest until you reach the launch site. Visitors entering through Gate 1 at CCAS should follow Philips Parkway to Central Control Road and turn right to ICBM Road and turn left there.Places to go and people to see at KSCs 1998 Open House! Unity will be one of the International Space Station elements on display for visitors at KSCs 1998 Open House. It is located in the Space Station Processing Facility. 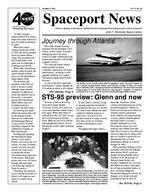 SPACEPORT NEWSPage 3 October 9, 1998 What can the debris around a construction site tell you? You could probably determine what materials and tools were being used and maybe figure out the type of structure in process. Interestingly, the first mission of NASAs New Millennium Program will be looking at debris left over from the formation of our solar system 4.5 billion years ago for the same reason. By studying this celestial debris, referred to as asteroids and comets, scientists expect to learn how the solar system was formed and what its original building materials were. Although Deep Space 1, scheduled to launch aboard a Boeing Delta II on Oct. 25 from Cape Canaveral Air Station, will test two science instruments, this mission is one of the first-ever deep space NASA launches to have technology, rather than science, as its key focus. The technologies being tested on Deep Space 1 generally fall into two categories those concerned with making future spacecraft smaller and less expensive and those concerned with making spacecraft more autonomous. The most important part of this mission takes place during the six months immediately following launch, when Deep Space 1 will test most of its dozen new technologies. Much of the key testing will be completed within the first eight weeks after launch, and the technologies that the spacecraft depends on for its basic operation, such as new solar arrays and a transponder, must be proven to work within the first hours after launch in order for the mission to proceed. By the end of its prime mission, Deep Space 1 will have also demonstrated the feasibility of reducing mission preparation periods to as short as 39 months from initial concept through launch and of reducing mission budgets to nearly half that of other recent NASA missions.Deep Space 1: Testing technologies for tomorrows space programDeep Space 1 is budgeted at $152 million. An ion propulsion engine evocative of rocket systems described in science fiction is among 12 innovative technologies to be validated during the mission. Also being tested are technologies designed to make spacecraft smaller, less expensive and capable of more independent decision-making so that they rely less on tracking and intervention by ground controllers. Xenon, the same gas that fills photo flash tubes and glows brightly in many lighthouse bulbs, will be the propellant for the ion propulsion system. Although this type of engine has been tested in What is ion propulsion? Ion propulsion is a technology that involves ionizing a gas to propel a craft. Instead of a spacecraft being propelled with standard chemicals, the gas xenon (which is like neon or helium, but heavier) is given an electrical charge, or ionized. It is then electrically accelerated to a speed of about 30 km/second. When xenon ions are emitted at such high speed as exhaust from a spacecraft, they push the spacecraft in the opposite direction. What implications does this technology have for space exploration? If Deep Space 1 is able to show that electric propulsion works as well as is expected, there will be many new missions that will take advantage of it. Deep Space 4 is expected to use four ion engines to fly alongside a comet in 2005 so that it can land. Ion propulsion is not of value for missions that require high acceleration, and it often will not be worthwhile for missions that can be done quickly using conventional propulsion systems (such as missions to the moon). But for a wide variety of missions with high energy requirements (such as missions to asteroids and comets, the inner solar system planets, and some to the outer solar system planets), the low but steady acceleration of ion propulsion wins out over the less efficient bursts from chemical alternatives. Keep your eye on the ionslaboratories and on Earth-orbiting satellites, only now is it being flight-tested as the primary propulsion source on a deep space mission. If it proves successful in flight, ion drives are likely to be used on many future deep space and Earthorbiting missions that would otherwise be impractical or unaffordable with conventional propulsion systems. The small engine with the ghostly blue exhaust is deceptively powerful, more so than any engine ever before flown in space. Unlike chemical rockets using liquid or solid fuels, the ion drive emits only an eerie blue glow as ionized atoms of xenon are pushed out of the engine. While the ion engine is slow to pick up speed, over the long haul, it can deliver 10 times as much thrust per pound of fuel as liquid or solid fuel rockets. The mission also features three key experiments that give the spacecraft more autonomy in navigating and general decisionmaking. Two advanced, highly integrated science instruments are being tested in flight for the first time. Deep Space 1 will fly by asteroid 1992 KD in late July 1999, sending back images in infrared, ultraviolet and visible light. Also included are many investigations of charged particles in space called plasma including the effects, if any, of the ion propulsion engine or its exhaust on the science instruments and the space environment. The Deep Space 1 mission is managed for NASAs Office of Space Science by the Jet Propulsion Laboratory, Pasadena, Calif.Spacecraft Mechanical EngineerAndy Rose places a paper signed by workers in the Payload Hazardous Servicing Facility inside a compartment in Deep Space 1. The first flight in NASA's New Millennium Program, Deep Space 1 is designed to validate 12 new technologies for scientific space missions of the next century. SPACEPORT NEWS October 9, 1998 Page 5 Atlantis ...(Continued from Page 1)cockpit, says Allen Hoffman, Boeing orbiter major modification/production, assembly and test director. The cockpit is the most extensive part of the overhaul. During Atlantis cockpit modification, all of the old dials, gauges and knobs were replaced with the latest in computer technology. The digital display system, or multi-functional electronic display system (MEDS), was mostly built in Palmdale, except for the screens. MEDS replaced the cockpits four cathode ray tube screens, mechanical gauges and instruments with full-color flat panel displays like those currently in use on modern commercial jet airliners or military aircraft. The previous electro-mechanical devices were becoming obsolete and more expensive to maintain. Oribters are disassembled almost down to the airframe at the Palmdale factory for an extensive and vigorous inspection process that analyzes every part of the vehicle. Even difficult-to-reach areas around the antennae are examined. Many of the thermal protection tiles are removed to get to where the antennae are stored so special X-ray equipment and a video borescope can look for trouble. A borescope is a snake-like fiber optic camera that can see in tight spaces. The same equipment is used to inspect hard-to-reach areas of the entire orbiter. Knocking off a few pounds Saving weight is one goal of orbiter modifications and maintenance. On Atlantis, a weight savings of more than 1,000 pounds was achieved by replacing older thermal protection tiles with a new, lighter-weight material over about 3,000 square feet of the orbiters exterior. The weight savings allows the orbiter to haul heavier cargo like International Space Station components into space. The Nomex felt blanket with its flexible rubberized material can withstand temperatures of 750 degrees Fahrenheit and protects the vehicle from intense heat. Nomex felt blanket material replaces much of the heavier thermal protection blankets made of Atlantis has 24,000 thermal protection tiles. Thermal protection tiles are made of silica (essentially, sand), which also is used to make glass. No spare tiles sit on a shelf; most are fabricated by computerized machinery as required. Tiles range in thickness from a quarterinch to four-and-a-half inches thick. The most damage to Space Shuttle termal protection tiles is during liftoff, when ice from the three main engine cones, external tank and propellant lines pound the heat shields. Shuttle leading edges and the nose cone are made of reinforced carboncarbon material capable of withstanding the extreme temperatures of re-entry. Gaps in the tiles are filled with quartz fabric and inconel foil gap fillers.Modifications and maintenance were performed on the orbiter Atlantis at Boeings orbiter assembly facility in Palmdale, Calif. Photo credit: Tom Tschida, NASA Dryden Flight Research Center. The first fully digital cockpit for Shuttles is now in Atlantis. Full-color displays replace buttons, knobs and dials. Photo credit: Tom Tschida, NASA Dryden Flight Research Center.Atlantis tiles tidbitsquartz fabric that had protection of up to 1,400 degrees. Engineers determined through the orbiters many flights that the areas where Nomex thermal protection now is used dont generate as much heat as other areas of the orbiter. Along with the detailed nose-to-tail inspections and replacement of dated flight hardware, workers outfitted Atlantis with an external airlock equipping it for International Space Station docking missions. SPACEPORT NEWS Page 6 October 9, 1998 P escription D ugs and over-the-counter medication Drugs and medication are so common in our lives today that sometimes we dont stop to think how often, and perhaps how casually, we take them. They can alleviate symptoms and, in some cases, cure disease. But medicines can be double-edged swords. Each person has a unique way of responding to drugs, and reactions to a certain drug are not the same for everyone. It is important that you take medications exactly as your doctor prescribes and not share the drugs with anyone. Octobers Health Education and Wellness packet offered by KSCs Medical and Environmental Health Office contains information on many different kinds of medications, how your body metabolizes them, side effects and drug interactions, generic versus brand name medications and how to keep your medicine chest safe. The packet is available at all medical facilities or upon request to Carol Roth, BOC-005, at 867-3414 or 867-2026. A new Safety on the Line newsletter, created by NASAs Safety and Mission Assurance Directorate, is now available to employees. Its purpose is to disseminate safety and human factors information along with answers to questions received during Super Safety Day. A pilot program displaying the newsletter in area restrooms started Sept. 7 when more than 100 copies of the publication were posted in the Headquarters Building, the Operations and Checkout Building, the Space Station Processing Facility, the Operations Support Building, and both launch pad areas. New issues are scheduled to be posted every two weeks. According to the newsletter editors, Marguerite Davis and Alan Zoellner, they see this as a unique method to educate employees about safety and human factors. They stated that a large part of the initial success has been the excellent NASA and USA contractor personnel who volunteered to replace issues in their work locations. Their assistance has been invaluable. Employee comments or questions are encouraged. If you have a question or comment about this newsletter, call Marguerite Davis or Alan Zoellner at 867-3311 or -3199.Safety on the Line newsletter debutsThrough Combined Federal Campaign, you can touch somebodys life The 1998 Combined Federal Campaign (CFC) kicked off Oct. 1 at 9 a.m. in the Training Auditorium. Associate Director for Advanced Development and Shuttle Upgrades JoAnn Morgan opened the event, stating that the caring the center must show for this kind of humanitarian effort is very important. I have been witness to the giving and caring of KSC employees over many years, Morgan noted, and I know the good results that come from the kindness and generosity of our KSC workers. Morgan knows through direct experience, too. Her own personal success story is listed onYou can sign up for your donation on-line, as KSC Director Roy Bridges did, by checking out the form at http:// ap03.ksc.nasa.gov/CFC/ Donating is easy through the website provided by this years CFC committee.KSCs CFC Internet site, located at http:// ap03.ksc.nasa.gov/CFC, among several personal stories of KSC employees whose lives have been touched through CFC funds. The theme of this years campaign is Touch Somebodys Life, and through the link provided on KSCs internal page, you can find out how many people have been reached through KSC employee contributions. Through the Web site, you can find out who your directorate representative is, read about local success stories, check out frequently asked questions and answers, read about what your gift can buy, locate an index of charities, find out about visits to local agencies, and much more. This years campaign runs through the end of October. The goal this year is $210,000, which is a five percent increase over last years goal.October is National Disability Employment Awareness Month The Disability Awareness and Action Working Group (DAAWG) has planned a Technology Fair in conjunction with National Disability Employment Awareness Month. The technology-oriented fair will be held from 10 a.m. to 3 p.m. on Oct. 20 in the lobby of the Headquarters Building and on Oct. 21 in the Operations Support Building lobby. Some of the vendors participating this year include Space Coast Center for Independent Living; Stuart Eye Institute of Jupiter, Fla.; Valencia Community Colleges Center for High-Tech Training for Individuals with Disabilities; and Blind Services. The theme for this years National Disability Employment Awareness Month is Opening Doors to Ability This theme sends a powerful message that people with disabilities possess boundless talents, vastly diversified skills, and abundant energy for the work that needs to be accomplished, said Center Director Roy Bridges. This month is a special time for all organizations to recognize the tremendous value and potential of our employees with disabilities, and to recommit and dedicate ourselves to the empowerment, integration, employment, and full inclusion of every one of our citizens with disabilities, he noted. All KSC employees are encouraged to visit one of the locations and learn about the types of technology and services available to assist persons with vision, hearing and mobility impairments. DAAWG advises the center director on matters relating to employees with disabilities and serves as a resource for the Equal Opportunity Program Office, the Administration Office and others. In addition to inviting employees to visit one of the fair locations, DAAWG also welcomes visitors to their home page on the Internet for all of the latest information. The address is http:// www.ksc.nasa.gov/groups/daawg.DAAWG Technology Fair Oct. 20, HQ Oct. 21, OSB 10 a.m. to 3 p.m.
SPACEPORT NEWSPage 7 October 9, 1998 Professional Development Program participants honoredA graduation ceremony was held in July for the 1997-1998 Professional Development Program (PDP) class. This program provides competitively selected NASA professional staff with developmental work assignments, usually of four to 12 months duration, away from their normal worksites. The goal of the program is to provide future NASA leaders with a broader perspective of the Agency and the impact of NASA programs upon developing technology. This years PDP class included 21 participants from eight centers. Seen here with NASA Administrator Daniel Goldin are KSC participants, left to right, Mechanical and Propulsion Engineer Ron Mueller, Mechanical Systems Engineer Daniel Levy, Shuttle System Engineer Deborah Morris and Chief Information Officer Barbara Brown. Not shown is Public Affairs Office Media Services Branch Chief Lisa Malone. William Barry, M.D., has been selected to head NASAs Occupational Health Program (OHP). In this Senior Executive Service position, Barry will provide policy, guidance and evaluation of the effectiveness of the NASA program effort of nearly 400 health professionals at 10 research and space centers nationwide. Last year, KSC was identified as NASAs lead center for occupational health. Barry has extensive medical and management experience in hospitals, private practice, industry and the military. He began his career as a flight surgeon with the U.S. Navy, advancing to the rank of commander before his entry into the private sector in 1977. He served on the USS Midway and the USS Saratoga during the Vietnam War and represented the Navy on the Joint Service Operation Homecoming, providing treatment and evaluation of returning prisoners of war at Clark Air Force Base, the Philippines. Following his naval career, Barry joined The Upjohn Company as manager of Health Surveillance, eventually becoming director, Worldwide Drug Experience. In 1991, Barry joined the Battle Creek Health System, Tampa, as director of the Department of Occupational Medicine and Health.Barry to head Occupational Health ProgramIn 1996, Barry took on the role of director, Occupational and Preventive Health Services of Florida Hospital, Heartland Division. In these leadership roles, Barry set strategic direction, ensuring the businesses grew while continuing to provide an environment conducive to employee occupational health. I believe Dr. Barrys broad experience with both military and public venues makes him an outstanding choice as manager of the Occupational Health Program, said Center Director Roy Bridges. The role of lead center for NASAs OHP office provides an excellent opportunity for an innovative physician to establish an effective program in an agency involved in exciting cutting edge technology for the 21st century. The OHP oversees occupational medical clinics and programs in the areas of health education and wellness, industrial and radiological health, employee assistance, workers compensation, public health, physical fitness and allied occupational health. Major goals are to recognize, evaluate and control health hazards associated with chemical, physical and biological agents; prevent occupational injury and illness; provide quality health care and counseling; avoid or delay the onset of premature employee death and disability; and assess and document Agency compliance with all applicable legal and regulatory requirements. Dr. Barry will be responsible to Dr. Irene Long, director of the Biomedical Office at KSC, for administration of the OHP, but will also work closely with the staff of the Chief Medical Officer at NASA Headquarters in Washington, DC.William Barry Michael Sumner receives prestigious Center Director AwardKSC Director Roy Bridges, at right, hands Michael Sumner the coveted Center Director Award on Sept. 23. Michael Sumner, J-BOSC transition manager and deputy director of the Joint Performance Management Office (JPMO), recently was awarded the coveted Center Director Award for his visionary leadership in the development and formation of pioneering joint base operations between NASA at Kennedy Space Center and the United States Air Force 45th Space Wing. As KSCs advisor on the Joint Base Operations Support Contract, or J-BOSC, Source Evaluation Board and lead for development of the original joint government organization (JPMO), he contributed significantly to the future of NASA and Air Force programs. The Center Director Award is granted at the discretion of the KSC director to a civil service employee who has accomplished a job-related task of such magnitude and merit as to deserve special center management recognition or who has exemplified through personal effort and innovation the highest standards and commitment to the application of continual improvement principles and practices. Sumners citation reads: In recognition of outstanding commitment to the future of NASA and the USAF through visionary leadership, change management and implementation of pioneering concepts resulting in signficant improvements for safe, cost-effective and reliable access to space. Sumners commitment is further demonstrated as he leads the J-BOSC transition as the governments recently announced transition manager. John F. Kennedy Space Center Managing editor. . . . . . . . . . . . . . . . . Bruce Buckingham Editor. . . . . . . . . . . . . . . . . . . . . . . Susan Maurer Editorial support provided by Sherikon Space Systems Inc. Writers Group. NASA at KSC is on the Internet at http://www.ksc.nasa.gov USGPO: 733-112/80016Spaceport News Spaceport News is an official publication of the Kennedy Space Center and is published on alternate Fridays by the Public Affairs Office in the interest of KSC civil service and contractor employees. Contributions are welcome and should be submitted two weeks before publication to the Media Services Branch, AB-F1. E-mail submissions can be sent to Susan.Maurer-1@ksc.nasa.gov SPACEPORT NEWSOctober 9, 1998 Page 8 A sign of the timesKSC director Roy Bridges signs the first good wish to the crew of STS-95 on a giant mural-sized good luck card for John Glenn and the crew of the upcoming flight of the Space Shuttle Discovery. The card, located at the Visitor Complex, was signed by thousands of visitors to the spaceport in late September and throughout this month. The shuttle flight, scheduled for Oct. 29, features space pioneer Glenns return to orbit. Workers put up plywood barriers on the windows of the Operations Support Building (OSB) as part of a precautionary plan as Hurricane Georges threatened Central Florida. In light of the unpredictable nature of hurricanes, the decision was made to minimize risk and provide protection to KSC personnel and to the Space Shuttle national asset. The Vehicle Assembly Building is reflected (left) in the uncovered windows of the OSB. Reflecting back... Hurricane threats and the anticipated arrival of the orbiter Atlantis couldnt deter about 110 runners from showing up at the Shuttle Landing Facility to participate in the ninth annual fall intercenter run/ walk on Sept. 24. The biannual run was a success, with the afternoon turning out to be exceptional race weather. Bananas and bagels were enjoyed by all after the race. The winners were: 2 Mile Overall Julie Rindfleisch Spencer Woodward Mario Mota 2 Mile Men Spencer Woodward Mario Mota Keith Britto 2 Mile Women Julie Rindfleisch Carmel Shearer Sharon Lay 5K Overall David Mayo Will Lockwood Doug Willard 5K Women Nancy Zeitlin Jennifer Adams Chris Alt 10K Overall Michael Taylor Greg Snyder John Hardos 10K Women Lisa StotzKSC employees run for their life! Journey to Atlantis draws more than 15,000A crowd of more than 15,000 students lined up to view the orbiter Atlantis at Fort Campbell, Ky. on Sept. 24, where it stopped for four days en route from Palmdale, Calif., to KSC. An estimated 50,000 people viewed the vehicle at Fort Campbells Open House two days later.The orbiters arrival at KSC was delayed due to the threat of Hurricane Georges, permitting visitors from as far away as South Carolina to travel to Fort Campbell to view the orbiter as it rested atop the Boeing 747 carrier aircraft.